This Pro-Co Sound ProCat 5 10/100 Base-T Ethernet Cable is designed for touring sound and permanent installations. The design eliminates stiffness and striation found in other Cat 5 cables. 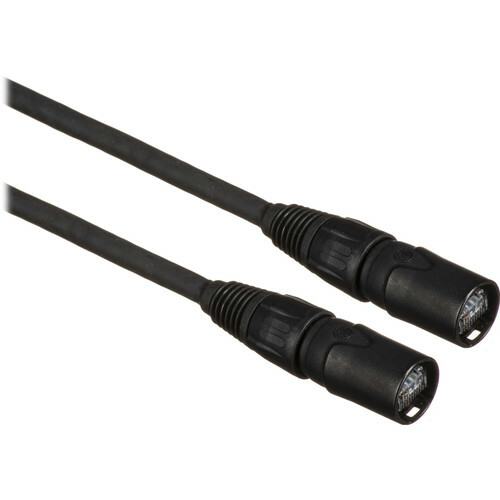 The EtherCon connection is a RJ-45 style connector designed for audio and video stage technology, DMX systems and harsh environments. The receptacles have a secure latching system. This is a feature not found on other RJ-45 receptacles. The cable comes complete with EtherCon male to male connectors. Box Dimensions (LxWxH) 8.1 x 7.1 x 3.8"